Feeding your cat a high quality diet is important for many reasons, including maintaining health and strengthening the immune system. As with humans, research has also shown that fatty acids are essential in a pet's diet. There are two main types of "essential fatty acids": Omega-3 and Omega-6 and they are not the same nor do they provide the same benefits. For the purpose of this article, we are only discussing Omega-3 fatty acids including: ALA (Alpha-linolenic acid), EPA (Eicosapentaenoic acid), DHA (Docosahexaenoic acid) and their particular benefits. Omega-3 belongs to a group of fatty acids known as "long-chain polyunsaturated fatty acids". Research into certain benefits of Omega-3's in humans can be contradictory and much more research is needed, however, it never hurts to try something new. These conditions happen as the body's response to the immune system over-reacting. Omega-3 fatty acids can lessen these harmful effects to the body. Research has suggested that fatty acid supplements may be useful in preventing atrophy (allergies to inhaled substances such as pollens and molds) from developing in young animals. Omega-3 fatty acids, especially EPA, may be helpful in reducing inflammation. EPA is found in marine fish oil. Diseases that are accompanied by inflammation (rheumatoid arthritis, ulcerative colitis, and inflammatory bowel disease) may respond to the anti-inflammatory effects of Omega-3 fatty acids. Hair and coats which are dull, brittle, and dry often respond to supplements with essential fatty acids, especially linoleic acid (LA). Marine fish oil is an excellent source of LA. The progression of a common yeast infection in dogs and cats, Malassezia Pachydermatis, can be slowed down by essential fatty acids. If you have a cat or dog that is prone to yeast infections of the ear, I personally would use a marine fish oil as a preventative. Various skin conditions in cats have been shown to respond well to essential fatty acid supplementation. Omega-3 fatty acids are also crucial for the proper development of the retina and visual cortex. Research has shown that Omega-3 fatty acids may prevent certain heart problems, including ventricular arrhythmias and high blood pressure. Animals prone to thromboembolisms (obstruction of a blood vessel by a blood clot that has become dislodged from another site in the circulatory system) may be helped by the anti-clogging effect fatty acids have on platelets. Omega-3 fatty acids have been shown to slow the development and metastasis (spread of cancer to a new body area or organ not directly connected to the original site of the cancer) of certain cancers. Products containing Omega-6 fatty acids are specifically NOT recommended in patients with cancers. Fish oils have been shown to decrease levels of triglycerides and cholesterol in the blood. Essential fatty acids are polyunsaturated fats, therefore, they do represent added calories so watch your pet's weight. A bit less food and fewer treats may be needed to offset the calories contained in a fatty acid supplement. 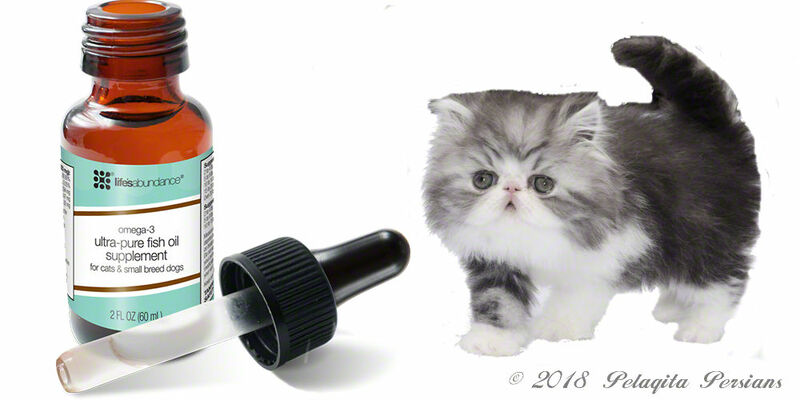 Occasionally, a pet may develop diarrhea from the addition of a supplement (as with any sudden change in a pet's diet), therefore, a supplement should be started at a low dose and gradually increased to the therapeutic dose to help alleviate this problem. A complete and balanced diet is indispensable for optimal health and a strong immune system. However, just like us, our pets can suffer from health issues (ranging from dry skin to cancers). Adding a Fish Oil Supplement to a cat's diet may help support your pet's healthy skin, coat, heart, brain, eyes, and joints. We use and recommend Life's Abundance Pet Fish Oil which has an IFOS 5-Star rating for purity, concentration and freshness. For more information on omega fatty acids, visit the Pet Coach Education page.